The ESD Surface Resistance Tester Iteco Labeohm EVO is usable in the EPA areas. 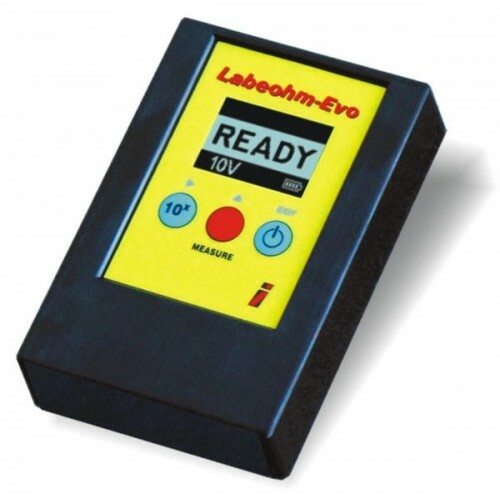 Labeohm EVO measures the surface resistance and the ground resistance of mats, worktops, floorings and other objects. The embedded probes are suitable for surface resistance measure, connecting one ground cord the resistance to ground can be read, and two external probes can be connected for point to point measurements. Labeohm EVO is pocket-size and use 2 embedded parallel electrodes, in accordance with DIN EN 100015/1. Bottom view of the Labeohm EVO meter: there are 2 parallel rubber electrodes between them and 2 bushings to which external probes can be connected. The Easy version allows to measure the order of magnitude of surface resistance or resistance to ground. The EVO version is more accurate (accuracy of ½ decade) , it displays up to one significant digit and it is equipped with a graphical display and programmable sound alarm. Iteco Labeohm EVO included cable, battery, box and ISO9000 Traceable Certificate.